The People’s National Stadium in Baghdad is one of the great landmarks in a country that has seen its fair share of ups and downs during the last few decades. However, even through 8 years of war with Iran in the 1980s, the 1991 Gulf War and over 10 years of sanctions and an invasion, fans have still continually flocked to the Al-Shaab stadium to watch their heroes play. On match days, the mood of the place completely transforms into a carnival atmosphere with the sound of trumpets, drums, singing and chanting, no different to when the stadium was opened more than 35 years ago. “The stadium is the purgatory for their sorrows,” says Ahmed Radhi, one of Iraq’s greatest footballers and a veteran of the 1986 World Cup. A devoted Iraqi fan explains his love and passion for the great stadium. The construction of the Al-Shaab stadium was funded by the Gulbenkian Foundation, situated in Lisbon, the reason why Benfica were asked to play in the inaugural game at the Gulbenkian stadium, which it was known as before the 1968 revolution. Calouste Gulbenkian was an Armenian oil magnet, who owned 5% of the Iraqi Petroleum Company before the nationalisation process during the 60s. After his death in 1955, he put his immense fortune and valuable art collection into the Calouste Gulbenkian Foundation, which now disburses funds for social and cultural projects in Portugal and also around the world. The opening game at the stadium was played in front of a packed crowd of nearly 60,000 delirious fans. The name that nearly every fan had on their lips even hours before the big kick-off was Eusébio or “Ozibio” as one Iraqi fan pronounced his name. “Ozibio was my idol” says taxi driver Talal. “I saw him in person when Benfica came to Iraq” he says clutching an old black and white photo of the Portuguese forward as a reminder of that day. Less than 4 months earlier, the Mozambique born striker had enthralled football fans with his breath-taking skills, pace and outstanding goals at the World Cup in England. Eusébio had been considered the greatest player in the world after his 9 goals earned Portugal a third place finish in their first ever World Cup finals while also earning himself the Golden Boot. Benfica at the time were one of the best teams in the world having won the European Cup in consecutive years in 1961 and 1962. The side that came up against Baghdad included 6 members of Portugal’s successful 1966 World Cup squad, goalkeeper Costa Pereira, defender Fernando Cruz, forward José Torres, the two wide men António Simões and José Augusto and the “Black Panther” himself Eusébio. The Baghdad Select team was formed especially for the occasion and fielded players from four top teams in the Iraqi capital. The team had been formed a number of times for the visits of foreign teams from Egypt, Bulgaria, Hungary and the former Soviet Union during the 50s and 60s. Like the Portuguese, Iraq was also on a high after the national team had won their second consecutive Arab Cup at the Al-Kashafa (Scouts) stadium in Baghdad, only 6 months earlier. One of the most respected Iraqi coaches at the time Adil Basher, who lead the national team to the 1966 Arab Cup win, took command of the team. The side included a number of players from the Arab Cup winning team including the two-goal hero in the final, Gorgis Ismail. They also had Iraqi number one keeper Hamid Fawzi to rely on in goal. He had just returned to Iraq after spending a short spell in Egypt with Al-Tayaran Al-Arabi, the first Iraqi professional to play in another Arab country. Qasim Mahmoud known as Qasim Zuwiya to his adoring fans and teammates captained the team. He was given the name by his school friends because of the area of the pitch he occupied during games (Zawiya in Arabic) and also because he lived in Zuwiya a Baghdad district of Al-Karrada. The left-sided attacker had been a member of the national team since the late 50s and was an instrumental part of the Arab Cup wins in 1964 and 1966. One surprise inclusion was the 17-year old Mudhafar Nouri, a striker who had been playing for his local team only a few months previously before making an instant impact for his new club, scoring a hat-trick on his debut! The stadium was packed for the historic encounter between the European giants Benfica and the Baghdad Select team. Many thousands of fans that could not get tickets tuned into the game on TV or radio. The crowd needed only 30 minutes to witness the opening goal at the new stadium, it came from the boot of towering Portuguese international striker José Torres, who had exchanged passes with Eusébio in a clever one-two in the build-up play before hitting a low and accurate shot past the Iraqi goalkeeper in the right corner of the net. It was one of the most eventful games in Iraqi defender Jabar Rashak’s career and he reflects back at the game with great fondness and pride. “I marked the greatest player in the world” referring to Eusébio. “I gave him no room to manoeuvre and prevented him from being a serious threat” he says with a broad smile on his face. Baghdad went into half-time 1-0 down but came out into the second half with more purpose and belief in them as they went looking for the equaliser. During the half-time break, Benfica had brought on reserve keeper Nascimento on in place of Costa Pereira, however one of the first things the keeper had to do was to pick the ball out of the net as the Iraqis eventually found a way past the Portuguese defence. The goal, which has now been imbedded into Iraqi football history, came 10 minutes into the second half after some good play from the creative midfielder Shidrak Yousef. He passed the ball into the path of man of the match Albert Khoshaba, who passed it to Qasim “Zuwiya” Mahmoud. Qasim raced past defender Humberto Fernandes, who had slipped after attempting to clear the ball to Cavém, and from 12 yards, Qasim hit a powerful and unbeatable shot past the substitute keeper. The moment the ball went into the net, the fans started to chant “Kulla min Qasim Zawiya, tahdam jabal aliya “(All from Qasim Zawiya, who collapsed the highest mountain). In the last 20 minutes of the game, both teams brought on substitutes in an attempt to win the game. Baghdad brought on forwards Mahmoud Assad and Mudhafar Nouri while Benfica substituted their goalscorer José Torres for the 20 year-old striker Nélson. For the late Mudhafar Nouri it was a hectic time in his life. It was a close game and the game looked like ending a draw until Benfica broke the hearts of the Iraqi faithful with a goal 10 minutes from time. It came from a shot from Cavém after the substitute Nélson was fouled outside the box. The former Portuguese international hit a long distance free-kick into the top right hand corner of the net. He also recalls a momentous occasion in the game that will live long in his memory. The pint-size left back Sahib Khazal remembers the game but it was an incident at the end of the game that he has most fond memories of. The remark was a clear indication that the Benfica coach had not paid much attention to Sahib’s height and concentrated more on the influence he had on the game and how well he had played. “Which was nice” Sahib added. Since that day in 1966, the fans at the Al-Shaab stadium has seen a number of highs and lows in Iraqi football, however whether it is Iraq’s 1979 Gulf Cup win, the devastating last gasp goal by Qatar that knocked out Iraq in the 1990 World Cup qualifiers or the recent wonder goal by the new Iraqi starlet Emad Mohammed against Thailand, the first topic of conversion between the fans about the stadium will also be about that game. 20 years after Eusébio played at the Al-Shaab stadium, the Brazilian club Flamengo arrived in Baghdad with their outstanding duo of Zico and Socrates in a warm-up game before the 1986 World Cup in Mexico, ironically during Iraq’s long road to qualification to their first ever World Cup, they never played a game at Al-Shaab, a stadium which has been the spiritual home of Iraqi football since it first opened in that famous game between the Baghdad Select team and Benfica. Hamid Fawzi – The late goalkeeper was one of the best custodians Iraq has ever produced. Hamid was born in 1939 and started his career at the tender age of 15 at his local club Haza Al-Ahly in the Baghdad district of Al-Fadhil, before being spotted by Al-Quwa Al-Jawiya. He was a hero to the Iraqi fans, clearly evident when the fans refused to accept his retirement from the game and continued to chant his name during Iraq’s matches months after he stopped playing. .
Hassan Ali – The right full back played for various teams during his 18 year playing career, including Army teams Al-Farqa Al-Thalatha and Al-Farqa Al-Khamisa. The player, who was known as Hassan Balah or Hassan ‘Scourge’ played for the Iraqi national team during the 1960s, helping Iraq to the 1965 Arab Military Games title in Damascus and the 1964 & 1966 Arab Cup win. Hussein Hashim – The midfielder was part of the successful Iraqi national team of the 1960s that won two consecutive Arab Cup tournaments in 1964 in Kuwait and 1966 in Baghdad. Born in Basra in 1933, Hussein started with the Al-Farqa Al-Awola in 1951 before joining Al-Minaa in 1956 and then signing for Baghdad club Air Force, two years later. He retired in 1972 at the age of 39. Jabar Rashak – The tough tackling and competitive central defender was born in Nassriya in 1942 and started his career in the district of Bab Al-Shaikh with Al-Shaikhliya in 1955, before moving first to Amana Al-Asama in 1957, Al-Maslaha in 1961 and then Al-Farqa Al-Thalatha in 1966. He was forced to retire in 1971 after surgery in Bulgaria on a knee injury received in a friendly game against a German club. Sahib Khazal – The ‘Black Rock’ was a tough-tackling left fullback, who played for the Air Force in the 60s and 70s. He was a player who took no prisons on the pitch, which he demonstrated when he fouled an opponent in a game against China, injuring him so badly that he had to leave in an ambulance! He played for Iraq in their first ever World Cup qualifying campaign in 1973. Basil Mahdi – The cool and calm central defender was known for his long and powerful throw-ins. Born in Baghdad, Basil started playing basketball before concentrating on a career in football. He started with a side which represented the Oil refinery in the Baghdad district of Al-Doura, before moving onto one of Iraq’s top clubs Aliyat Al-Shurta. Shidrak Yousef – The talented midfielder was brought up on the large RAF base in Habbaniya and started his career with the C.C. team (Civil Cantonment) in 1960, where he played for two years. In 1963, he moved to Baghdad and joined Army team Third Division. He won the Arab Cup in 1966 and was voted Iraq’s Player of the Year by the Iraqi sports newspaper Al-Riyadha. Gorgis Ismail – The forward will always be remembered for the two goals he scored against Syria at the Al-Kashafa stadium that helped Iraq to the 1966 Arab Cup. Gorgis or ‘Korkis’ as his name is pronounced started at the Assyrian Sports Club in 1957 before joining the Army team Armoured Third Division 3 years later, where he spent his whole playing career before turning to coaching in 1973. Qais Hamed – The late great started his career with the Esla Al-Mae in 1960 and after guiding his team to promotion to the top flight he moved to Al-Maslaha in 1962, where he won two league titles. In 1965, Qais chosen by the highly respected Egyptian coach Mohammed Abdou Saleh Al-Wahsh to play for the Arab national team. Albert Khoshaba – Started his career with RAF Employees’ Club in Habbaniya in 1954. A year later he was called in for his national service and played for Armoured Third Division and in 1957, he moved to Al-Maslaha. He emigrated to England in early 1966 but returned due to homesickness and rejoined Al-Maslaha. Eusébio gave him his jersey and commended him on his performance after the Benfica game. Qasim Mahmoud – Qasim Zuwiya as he was known during his playing career was one of the best players of his generation. The left-sided winger was a handful for any defence and with his Air Force team-mate Husham Atta Ajaj on the right wing, the two formed a formidable attacking line-up that helped the Air Force Club to the Iraqi League, Cup and Army Championship in 1963. Mahmoud Assad – Mahmoud was one of the best forwards of the 1960s. He played for the Army team Third Division alongside fellow international strikers Nouri Dhiab and Gorgis Ismail. 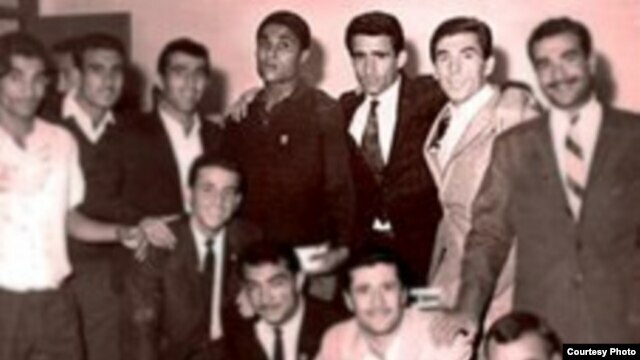 In 1966, Mahmoud was called up into the Iraqi national team squad for the Arab Cup in Baghdad, where he won a gold medal. Mudhafar Nouri – One of four footballing brothers, Mudhafar was born in 1948 and started his career in 1965 with a local team which that represented the Oil refinery in the Baghdad district of Al-Doura, before then joining Aliyat Al-Shurta in 1966 and scoring a hat-trick on his debut in a 4-0 win over Al-Hasaka of Syria. He was abducted by unknown gunmen in 2007 after they stormed a meeting held in Sadr City by the Al-Sadr City Council and is presumed dead. Iraq remembers Eusébio the same way I will always remember Iraq.